Step One: Paint your nails with two coats of a navy blue color. I used Midnight Cami by Essie. Let dry. Step Two: Pick a handful of favorite colors that compliment your base color. Step Three: Before painting on confetti, brush most of the paint off the brush and use the tip to slowly confetti the corner of your nails. Use one color with 3-4 dots on each nail at a time. Feel free to layer the confetti a bit and be sure not to have an excess amount of polish on the brush or you'll end up with a huge glob dot! Let dry. And that's all! Mix and match your favorite colors. For a fun-fetti inspired color palette, use white as your base coat and bright colors for the confetti (red, yellow, blue, pink etc.). 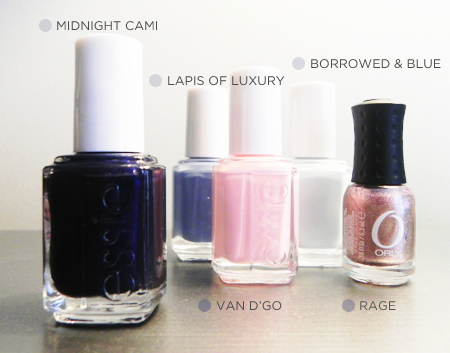 * Essie - Midnight Cami, Lapis of Luxury, Van D-GO & Borrowed & Blue purchased at ULTA $8.00 /// ORLY - Rage purchased at ULTA $3.50 /// Rings - Purchased at H&M. Have any beauty column topics you'd like to see on this feature?? -- Happy polishing! PS - Check back tomorrow for a fantastic sponsor giveaway post! OOooh! Pretty! I will definitely give this a try. I love all of these nail polish tutorials...they are feeding my new nail obsession. This one is just gorgeous! I feel a nail polish shopping spree coming on! I LOVE this! And Midnight Cami is one of my faves. Too cute! I very rarely paint my nails. But when I do I really like it! Sponsor in September + Giveaway! Fancy Shmancy: Favorite Etsy Shops! MaieDae Graphics: NEW Blog Designs! Fancy Shmancy: Get in my Wardrobe Edition!